When a group from All Saints' travelled to Ely earlier in the year for our first tentative rail adventure there was much enthusiasm for further trips and I resolved to try to do two per year: a shortish one in the autumn or winter and a longer one in the spring or summer. 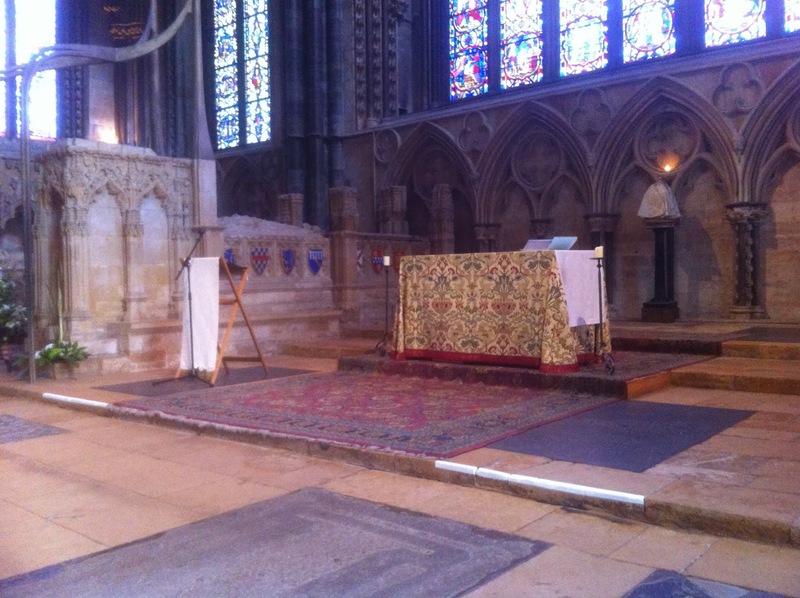 So for this year's autumn trip I arranged a visit to our own cathedral at Lincoln on 16th November, the eve of St Hugh's Day, St Hugh being the Bishop who had the cathedral built after the Norman original was almost completely destroyed in an earthquake. I was graciously allowed to preside at the 12:30 celebration of the Eucharist at St Hugh's Shrine, and the trip was organised around this pivotal event. We began with the 08:01 train from Stamford to Peterborough where we connected with the 08:33 direct to Lincoln via Spalding and Sleaford. Good views across the fens were had once we were clear of Peterborough: across to Crowland Abbey between Deeping and Spalding, and the enormous bulk of the Bass Maltings as we approached Sleaford. North of Sleaford the train stops at two very small stations opened in the 1970s and now very popular with people going into Lincoln and into Sleaford for shopping and other purposes. As we drew near to Lincoln the view of the cathedral towering over the city was awesome, even through the November mists. Arrival was on time at about 10:00 - not a fast trip but an interesting one. 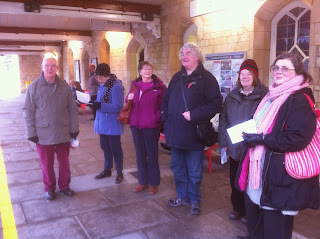 All of us managed the walk up the hill to Exchequergate and through to the cathedral where we were warmly greeted. Most opted for a guided tour while I sought out a verger to make the arrangments for the service. No-one seemed quite sure whom they were expecting because I had just been written into the diary as "Dean of Stamford" which did not mean a lot to most of the staff! I had time for a quick look around to ensure that the plans for a later walk would not be affected by road works or similar and thenit was time to worship. Although I had often taken part in services at the cathedral I had never led one before and this was quite as experience: no two churches ever do things quite the same way and I had to keep my wits about me (it was gratifying to be approached at the station several hours later by a stranger who had been there and thanked me for the service, so I must have got it about right!). After the Eucharist we had lunch at the cathedral's refectory and then set off on a brief tour of one quarter of the Roman city wall. There is not much of it left and most is only foundations, but the section from the east gate, by the exit from the refectory, to the north gate is easy to follow and there are information boards here and there. Regrettably the north gate is having some substantial repairs done and is covered in hoardings so we did not see much of it, the only Roman arch in the country still in use by road traffic. We then walked back towards the cathedral and castle along Bailgate, stopping to look at the well in the Roman forum area and the site of St Paul's Church, probably founded by St Paulinus on his way to York to become the first Bishop there. we all went our separate ways, meeting again at the station for the next part of the adventure. Some of us had coincided near a city centre pub in the meantime and had a swift half together before strolling down to the station.